The meeting was broadcast on "Cablevision-Optimum" Ch. 15 and "Verizon FIOS" Ch. 37.
given the name "Bass" in honor of John Basilone. 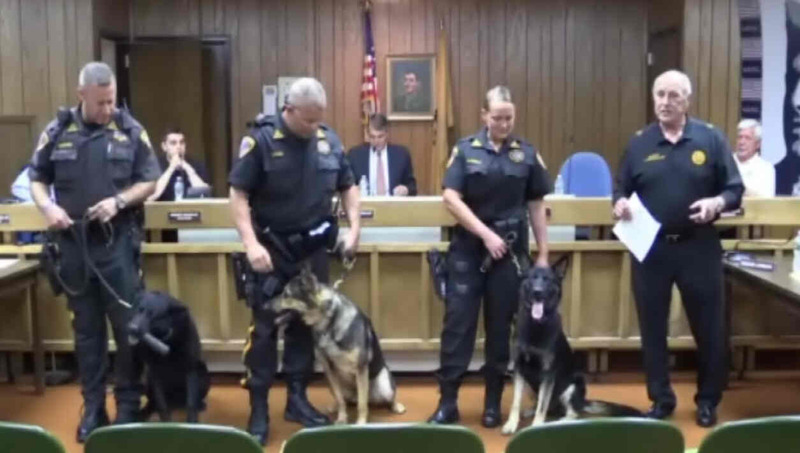 the Union County Canine Academy and is ready for duty. after years of service to the county. Police dogs are used to detect explosives, narcotics, and arson. Top Line Construction (they were the lowest bid) for $402,341. Some equipment was deemed no longer needed - a desk at the police department and a computer at Public Works. The Raritan Police Department has been approved to participate in the "1033 Military Surplus Program". Raritan Police Officer - Kathy Sausa - ran a DARE program at St. Ann's School. Mayor McMullin praised her for her ability to connect with the kids. The Mayor hopes that this program can be held at JFK School. A "Police Interceptor SUV". There are 3 payments of $9608 each. remove and replace a 15 inch pipe at Riverside and Columbia Avenues. Dawn Wilde will be joining the Historical Committee. that a while back he decided to look into the possibility of renaming the Post Office after John Basilone. He has contacted Representative Leonard Lance and things are in the works. The next step is that paperwork will be received by the council from the government to move this along. The name should be "The Sergeant John Basilone Post Office". that it has been a pleasure working with Raritan. The Mayor and council thanked him for his service.